Introducing cultural opportunity mapping assessments and responses (COMAR). To introduce an integrative planning framework – Cultural Opportunity Mapping, Assessment and Responses (COMAR) that can be used by Manawhenua. COMAR is a multiple-step integrative framework. Māori have a range of assessment tools they can utilise. We must begin thinking like a river if we are to leave a legacy of beauty and life for future generations. This process has, as its central tenet, delivering cultural outcomes to Manawhenua. However, it also requires examination of the causes of alterations, and the scale of the alterations that have resulted in cultural impacts both positive and negative being experienced by Manawhenua. Ultimately it is these impacts that may serve to limit realisation of outcomes. Each of the components in Figure 1 is described in the paragraphs that follow. Click on the image to download a PDF file. What are the values and significance of the area / resource? Attributes of the respective beliefs, values or cultural practices are documented in this step in the process (Tipa, 2010). Maori values are often detailed in resource management documents including Cultural Impact Assessments* and Cultural Values Reports*. Although section 6 (of the full Guidelines Report) requires managers to recognise and provide for these cultural concepts, it is not always explicit how this occurs within current management processes, especially flow setting processes. This step provides a general overview of the relationships of Manawhenua with the defined area or resource and as noted above is akin to a Cultural Values Report. Methods of data collection include hui and interviews with key informants (mandated by Manawhenua) to explore the diversity and complexity of cultural relationships with a catchment before defining how their relationship and interactions are affected by aquatic conditions. Gaining perceptions of changes to conditions over time, and the impact of these changes on values and practices, is fundamental. We acknowledge that whanau across New Zealand are already engaged in documenting their association with freshwater. The process for identifying the cultural aspirations of Manawhenua is via an attention to cultural opportunities. Aquatic conditions can impact the quality and condition of a site and consequently the opportunities afforded Maori. Significantly, these same aquatic conditions can also be manipulated to provide cultural opportunities. This stage, however, is premised on Manawhenua being able to describe the opportunities they seek. Diversity of belief, value and practice is accommodated within the process as the cultural opportunities sought are informed by traditional, historic and/or contemporary values of participants, and may be akin to ecological, economic, recreational, aesthetic and social opportunities sought by others, while some are distinctly cultural. Importantly it does not separate economic aspirations from a cultural context. Graphically representing interests has been used successfully in environmental conservation (Puginier, 1999). Using a participatory mapping methodology also recognises that visual depictions, especially maps and aerial photographs, are an important tool for communicating with hapu and whanau. They can be used at a variety of scales and have the potential to integrate with GIS to further manipulate and analyse data in different themes or layers to produce an overall map/dataset that can be useful for a range of planning purposes. Figure 2 is an example of a topographical maps upon which Manawhenua marked their cultural interests during a mapping exercise. Cultural Mapping therefore requires three distinct tasks to be completed. The first task involves preparation of a base map or aerial photograph upon which sites throughout a catchment are identified together with the values of each - in other words, the reasons for the site being of cultural significance are recorded. Participants and the facilitator accept that this style of mapping differs from conventional digital mapping in terms of accuracy because it is concerned with memories and observations in specific areas. Not all participants know, access and use every site drawn on these maps. Capturing the diversity of knowledge within the iwi, hapu, and whanau is important, and the groups are generally comprised of kaumatua, resource users, tangata kaitiaki, etc. Opportunities sought by tribal members (given the nature and extent of the values they have just mapped) are then recorded. This starts to move the mapping session to an aspirational – outcome focus. Finally, informants are to identify water related concerns they perceive to impact the provision of cultural opportunities at the sites mapped. These can be represented as a concept map, as shown below in Figure 3, which is recognized as an effective tool to elicit the belief systems that are used to perceive and analyse situations (El Sawy & Pauchant 1998, Weick 1979, 1995). ​A vision helps unite Manawhenua towards a purpose. It expresses ideas about what they want to see in a year’s time, or in ten years’ time, or any time in the future. A shared vision is an important element within their approach to management and, like opportunity mapping, is aspirational. Whanau and hapu across the country are undertaking cultural monitoring. The Ministry for Environment’s Environmental Performance Programme provided an impetus for an interest in monitoring. However, Figure 1 recognises that monitoring needs to take place within a context – it needs to add value to whanau, hapu and iwi planning processes. It is important that Manawhenua identify the assessment methods that are best suited to help them understand the barriers to their aspirations being realized. The Cultural Flow Preference Study is a specific type of cultural assessment. Manawhenua assess the extent to which they are satisfied that the flows they are observing are sufficient to deliver the cultural opportunities they seek. The application of a Cultural Flow Preference Study is described in the next webpage. Although “causes” is a term that captures many agents and types of change, in resource management contexts often these are separated into three categories: drivers and pressures. Drivers result in pressures, which can change a state of the resource. We understand these pressures by monitoring the state. But changes to the state have impacts which may or may not be acceptable to Manawhenua. Unacceptable impacts call for responses that mitigate an impact, restore the state, or reshape the drivers of change. Many whanau and hapu comment that they are reactive rather than proactive in resource management forums. 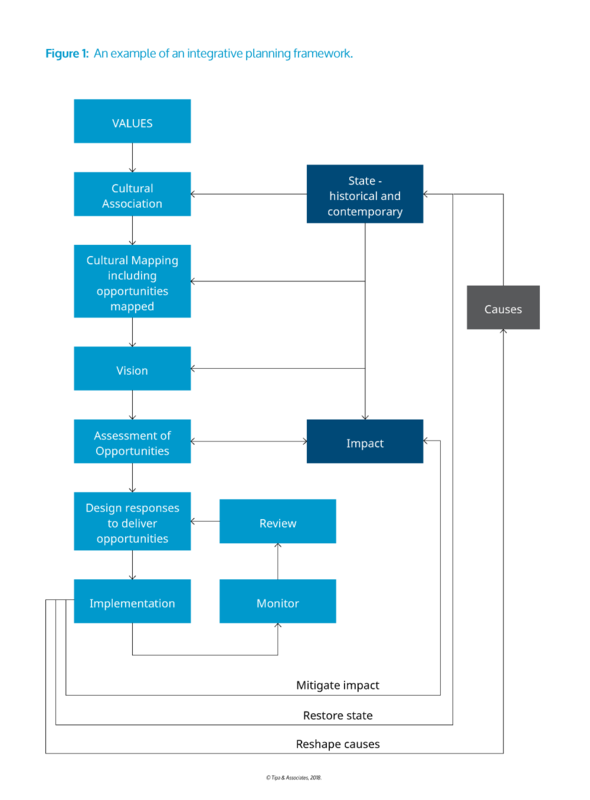 Although the process in Figure 1 has the potential to change this by actively mitigating and restoring the state and seeking to deliver cultural opportunities sought by Manawhenua, ultimately, they still risk continually being caught in a reactive cycle unless they reshape the drivers of the alterations being experienced in their takiwa. A specific pressure, hydro-electricity infrastructure has had an adverse effect on many catchments. 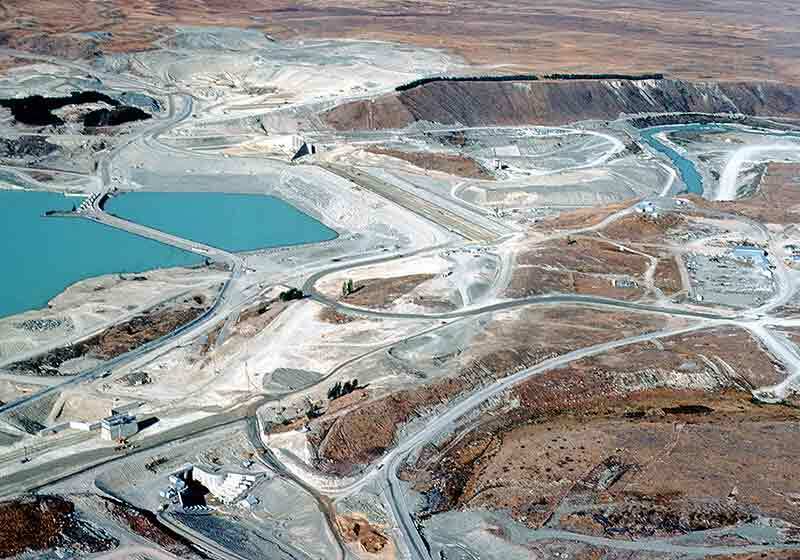 At left was the construction site when the Pukaki Control Structure was created. Manawhenua have a unique perspective that has shaped their association with the waterways within their takiwa. This perspective, which is underpinned by values and continues to be reflected today in their beliefs, practices and their vision for the future state of their takiwa. A starting point therefore is reconstructing the historic sate of the catchment (or study area). This historic understanding of the “state” is fundamentally important as it often represents the historic reference condition that Manawhenua often seek to restore of recreate. They may be seeking environmental flows to help achieve this desired state. reaches used for waka ama or boating. invasive species including introduction of exotic species. ​The material collected as part of this participatory exercise will also provide the context within which to assess the extent to which changes within the takiwa have impacted the health and wellbeing of Manawhenua. Having access to data about historic, contemporary and future states enables several comparative analyses that can help guide a pathway forward. to be effective in the long term, reshape causes of the degradation. A dewatered reach within the riverbed of a South Canterbury Stream. 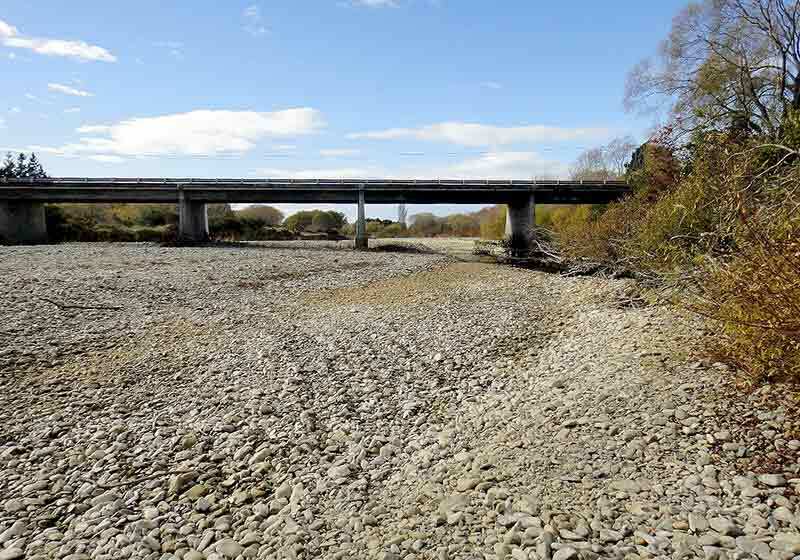 Manawhenua contend the dry reach is getting larger and staying dry for longer than it did historically. ​The process described in Figure 1 potentially aids implementation by providing a greater level of specificity than currently utilised by resource managers. Evaluation remains a critical tool for accountable, transparent and effective management and should utilise both quantitative and qualitative techniques.